I love holiday movies, no matter what the holiday. I have a collection that I like to add to. I was very happy to add to my Halloween collection with these two short movies from Dreamworks Animation. Scared Shrekless is the latest Shrek movie. Did you see Shrek the Halls a few years back? 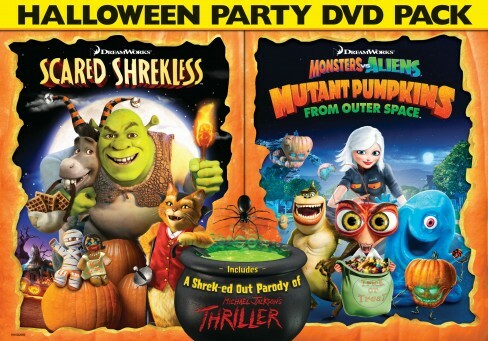 In Scared Shrekless, the gang gathers to celebrate Shrek’s favorite holiday: Halloween! But instead of the usual tricks or treats, Shrek ups the ante and challenges everyone to spend the night telling scary stories—the last one to be scared Shrekless wins. The DVD includes spooky spoofs on classics horror movies and features the voices of Mike Myers, Cameron Diaz and Antonio Banderas. If you know your horror movies, you will find these spoofs quite funny. The video also has the Shrek cast doing a spoof of the music video of Thriller by Michael Jackson which is pretty funny. I love the zombie donkey! Monsters vs. Aliens: Mutant Pumpkins from Outer Space finds Susan, B.O.B., The Missing Link, and Dr. Cockroach, Ph.D. dispatched as special operatives to investigate a mysterious alien presence on Halloween. As the night unravels, innocent-looking pumpkins are revealed for what they really are – mutant aliens! Luckily the monsters are there to smash the mutants’ wicked scheme to take over Earth. Monsters vs. Aliens: Mutant Pumpkins from Outer Space features the star-studded cast of voice talent from the original hit film including Reese Witherspoon, Seth Rogen, Hugh Laurie, Will Arnett, Kiefer Sutherland and Rainn Wilson. I actually haven’t seen the original Monsters vs. Aliens so I was a little lost with who everyone is and what their relationships to each other were but if you have seen it, it will make perfect sense I’m sure. You can watch it without knowing who they are though. This one was more funny than scary and was downright corny at times but would make a fun quick video for a child 6+.